Do you remember that commercial with the awkward woman mispronouncing ‘jalapeño”? Every single time I say jalapeño I am now tempted to pronounce it as Jah-lap-en-oh thanks to her. After hearing raves about candied jalapeños, I HAD TO try it out. 4 weeks ago, I did; and now I know what all the fuss is about! They are hot and sweet and addictive, and the ‘syrup’ is going to be incredible as a meat marinade (so be sure to can the extra syrup)! I must say I’d never before imagined buying 3 pounds of jalapeño at one time for any reason LOL. This is a very simple recipe, and won’t take long to make; but you have to put it away and forget about it for at least 2 weeks (I waited 4 weeks and believe me, they are plenty hot!). The earlier you try them, the hotter they will be. If you enjoy the idea of snickering quietly while watching people suffer, open and serve these suckers early. Loosely packed, this made 8 – 1/2 pint jars plus 1 – 1/2 pint of syrup. First and foremost – wear gloves . Do not touch your face or anything else – unless you are some kind of jalapeño-immune superhero you will live to regret the decision. The thought of this will immediately make your nose itch – prepare yourself mentally! I’m kidding, but seriously – wear gloves. 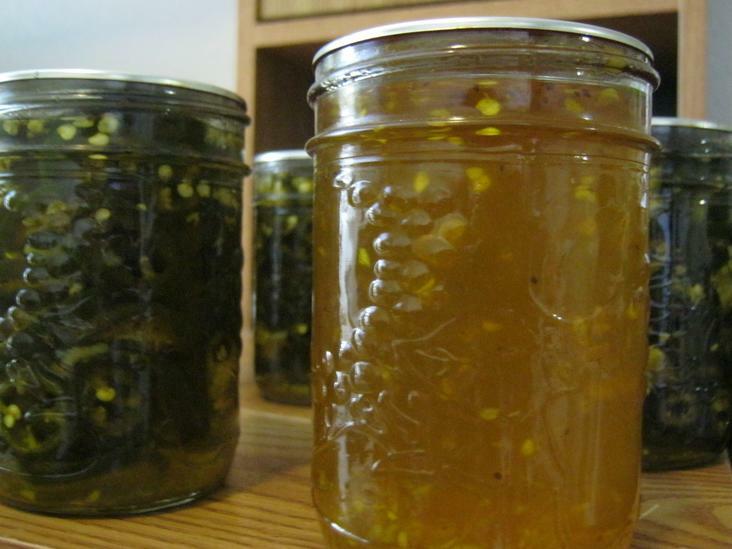 Gather your canning equipment and sterilized jars. Prepare jalapeños by removing stems, and seeds (if desired), and slicing into 1/4″ rounds using a mandolin or sharp knife. Set sliced peppers aside. It’s a bit tedious to remove all the seeds, so I left them in, but if you do take them out, they could be dehydrated for future use. In a large pot, add all other ingredients and bring to a boil. Reduce to medium heat, cover and simmer for 5 minutes. Bring vinegar back up to boil and stir in jalapeños. Cover and cook for 4 minutes. Use a slotted metal spoon to remove jalapeños to jars. Continue boiling the vinegar mixture another 6 minutes at a full boil. Ladle vinegar into jars to within 1/4″ of the rims. Use a chopstick to jostle out any air bubbles from the jars and a damp paper towel to wipe rims. Place warm lids on jars, and add ring to just finger tight. Place jars on rack in canning pot, making sure water covers the jars by at least 2″, cover, and bring to a full rolling boil. Boil hard for 10 minutes for 1/2 pint jars. For pint jars, process for 15 minutes. Check safe canning procedures for higher elevations. After 10 minutes, remove pot from heat and remove lid. Leave jars in water for 20 minutes. Use jar lifter to remove jars onto a towel on counter top without tipping jars, and in an area where they won’t be disturbed for 24 hours, and away from drafts. After 24 hours, check seals by gently pressing the tops. If the lid pushes in at all, it didn’t seal properly and must be stored in the fridge. Remove rings from jars, add labels, and store in a single layer* (no stacking) in your pantry for 2 – 4 weeks before use. Enjoy! These are so good, I know Kevin will be devouring them! 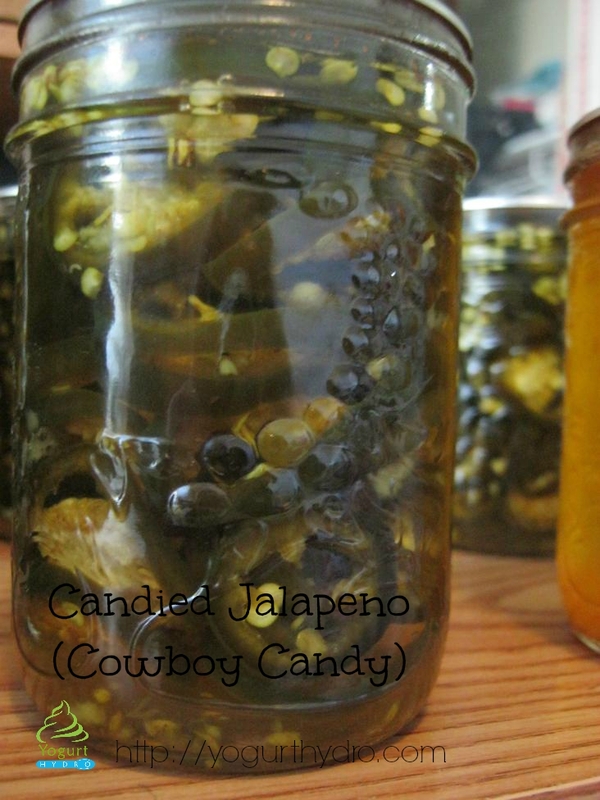 Have you ever tried candied jalapeños? I have to say I’ve been putting them on everything lol. Let me know if you try them! I’ve never tried these, but it sounds simple enough! 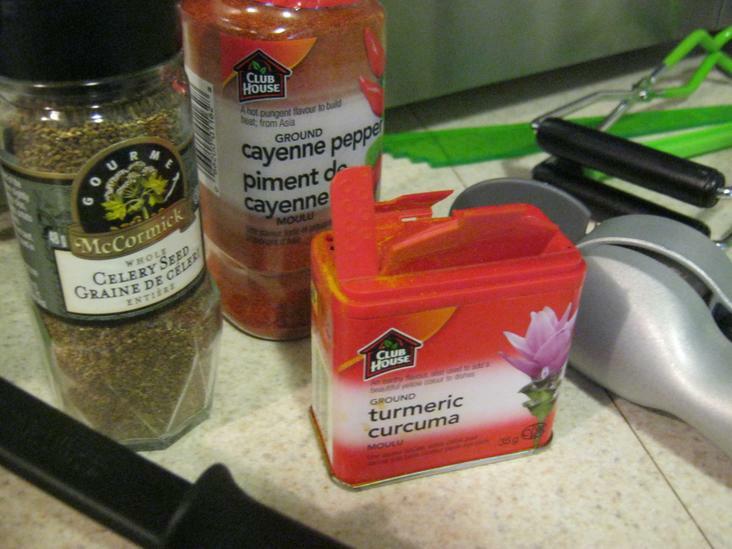 Yes, this would be good for a beginner, the recipe itself is fairly simple. Once you’ve gone through the steps of water bath canning once or twice, it’s much easier than it seems! One tip: have everything you’ll need laid out nearby and ready to use. I am not sure why, but I cannot stand cider vinegar, I can taste it in everything! Would it be okay to use regular pickling vinegar? Yes you can. It will change the flavor, but if you can’t stand ACV you can definitely use another vinegar as long as it is at least 5% acidity. White is fine, or any other type you enjoy. yum! sounds very goos. never seen this recipe anywhere! A pizza is not a pizza without jalapeno! I must make this for our pizza nights. Thanks for sharing. Seems like 6 cups of sugar is too much? Mine turned out to sweet? How long did you store it for before trying them out Gloria? The heat from the peppers will continue to infuse into the syrup over time. I find the syrup is sweet, but the peppers are still scorching hot, so it makes a nice balance. I will have to try these on my son who is a lover of hot Jalapenos. I am guessing a jar will be gone in a day. How many pints does one 3# recipe yield? This will make 8 half pint jars of jalapenos and 1 half pint jar with only syrup. I have made these for several years now, we just love them. Today I made a salid with cauliflower ,onions, garlic and the Jalapenos cut up small . For the dressing I put some mayo in a container and thinned it quite a bit with the juice from the Jalapenos ( that juice is so good ) After mixing I added some fancy shredded natural cheese on top .We loved it .I do remove the seeds so they aren’t so hot.